A green dream nursery for a client in east london — Inside Her Home. It's not 100% finished, as we will be fitting wooden shutters on the windows to control light in the room (hello 12 week lead time! ), but I wanted to give you a glimpse whilst we wait. Although the couple are expecting a little boy, we didn't feel restricted on colour and the pink Anthropologie rug, with its colourful pops and shapes, just felt right to bring everything together and act as a great focus point. The walls are painted in Farrow & Ball's Breakfast Room Green which creates feels fun and lively enough to hold the colourful accessories, whilst also creating a certain serenity in the room. The wicker penguin storage basket is from Zara Home - I mean, how could I resist!? The book shelving is from Ikea and the baby blanket is Mama's & Papa's. 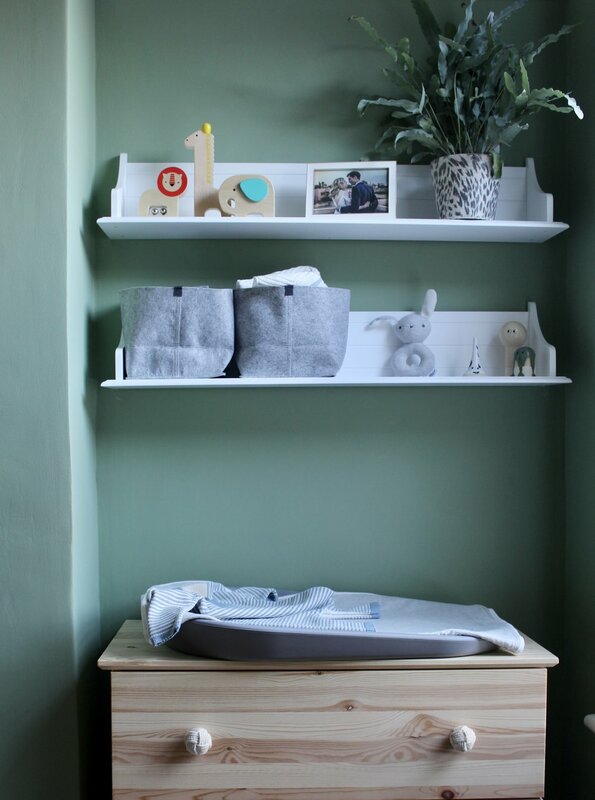 Using the alcove to create a functional changing station we chose felt storage organisers and a simple chest of drawers from Ikea to hit away nappies, muslins and baby grows. The handles were replaced with soft wool covered options. One benefit for choosing an Ikea chest such as this, is the dividing storage options they offer - great to keep all of the baby paraphernalia organised, and at a great price. The books and toys were purchased by the parents, but I particularly love the linen pig from Arket.